Canada's commercial seal hunt is a hunt like no other. It is a cruel and unethical practice that produces a product nobody needs. In fact, 98% of the animals killed in the past two years have been seal pups aged about 2 weeks to 3 months. This unmanageable hunt takes place over a vast area, making it impossible to carry out humanely. Some seals are killed with a blow to the head using a wooden club or hakapik. The sealers stun as many baby seals as they can before going back to kill them. Some seals try to get away, but they are clumsy on the ice, heaving their fat little bodies with an uncoordinated flipper shuffle. 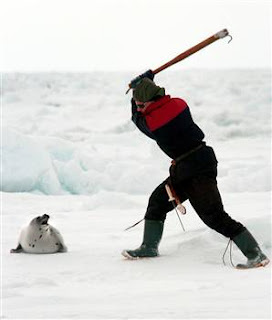 Other seals are shot from a distance and then dragged from the ice onto boats using steel hooks. Year after year, observers report abuses such as the hooking and dragging of live seals across the ice, seals clubbed or shot and left to suffer on the ice, and seals skinned while conscious. Two recent independent veterinary reports on the Canadian seal hunt, as well as IFAW video footage, have documented unacceptable levels of cruelty to baby seals. This hunt is a highly competitive activity, carried out over an extensive area, and under very unpredictable conditions. Haste is the rule, as hunters rush to immobilize as many baby seals as possible in the short time available to them. The Canadian government often misleads the public by comparing the commercial seal hunt to the killing of farm animals in the food industry. Unlike abattoirs, the seal hunt is an unpredictable, unmanageable hunt for wild animals which takes place under hurried conditions. It is precisely these conditions that have led some experts to conclude that this hunt can never satisfy the requirements of a humane hunt. Year after year, observers report abuse such as hooking and dragging of live seals across the ice, seals clubbed or shot and left to suffer on the ice, and seals being skinned while conscious. Even in good condition, a pelt is worth just $86 Australian dollars Yet so many are slaughtered that for the fishermen in Newfoundland, the annual cull nets just under 21 million Australian dollars. Pelts are exported to Norway, Russia, China and South Korea to be made into fashion garments that are sold all over the world. But because public hostility is growing towards the seal cull, unscrupulous dealers often deliberately mislabel seal fur, claiming it is rabbit, or even fake fur. I asked the animal welfare observers accompanying me, who have witnessed such scenes many times before, to tell me which aspect of the slaughter they find most distressing. One tells me how she has witnessed pups being dragged by hooks across the ice, and once saw a pup take 45 minutes to die after being clubbed on the head. "She was on the ice, just gurgling and crying, and there was nothing we could do to intervene." Another described how, when the hunt begins, the female seals all try to keep an eye on their babies until fear drives them into the water. Once the boats have gone, they all come back onto the ice, calling for their pups. They waddle up to the huge, steaming pile of offal that is left to rot on the ice (seal blubber is virtually worthless), and they actually sort gently through the bodies, trying to find their babies. "The sound the mothers make is so terrible, so plaintive, it haunts you for ever," she said. Perhaps the sound of the mothers wailing should be played at the next fashion show given by the likes of Christopher Bailey at Burberry, or Julien Macdonald, or Karl Lagerfeld or Amanda Wakeley. These designers will protest that they don't use seal fur - only silver fox or mink. By using animal fur of any kind, they make this sort of brutality acceptable and chic and normal, and lovely and desirable. Having witnessed the seals' desperate situation first-hand, I can vouch it is no such thing. It is utterly repellent.